Perfect Sense: A New Space in Barre Lets Kids With Autism Explore and Relax | Features | Kids VT - small people, big ideas! For Maleia Darling, a 20-year-old Barre woman living with autism, the everyday world is often unbearably overstimulating. Fluorescent lights, for example, cause her physical discomfort — they flicker painfully in her eyes and distract her. Though she's learned ways to better navigate the world and has fewer meltdowns than she used to, it's still a struggle to "cope in a world that is oh so out of my comfort zone," she writes (she's primarily nonverbal). 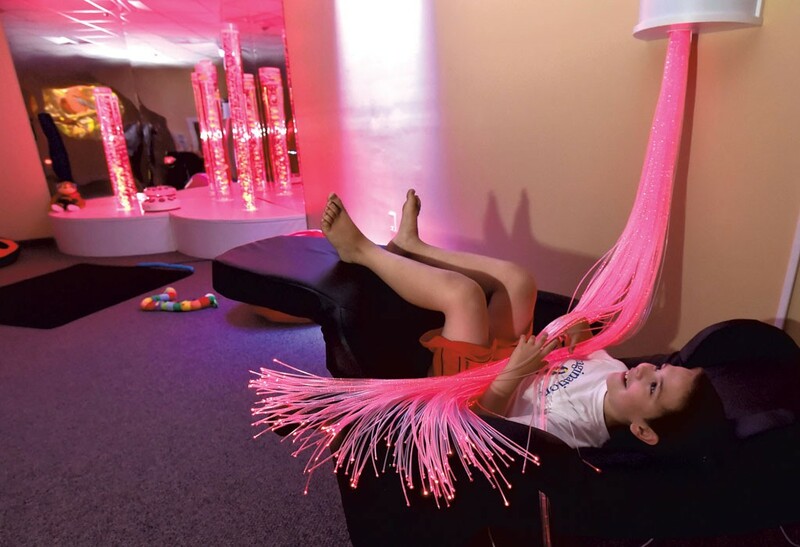 But there's one place she can go to calm her heightened senses and experience much-needed relief — the Imagination Station in Barre, which opened in May. Walking into the new space is a bit like stepping through the looking glass into another world. 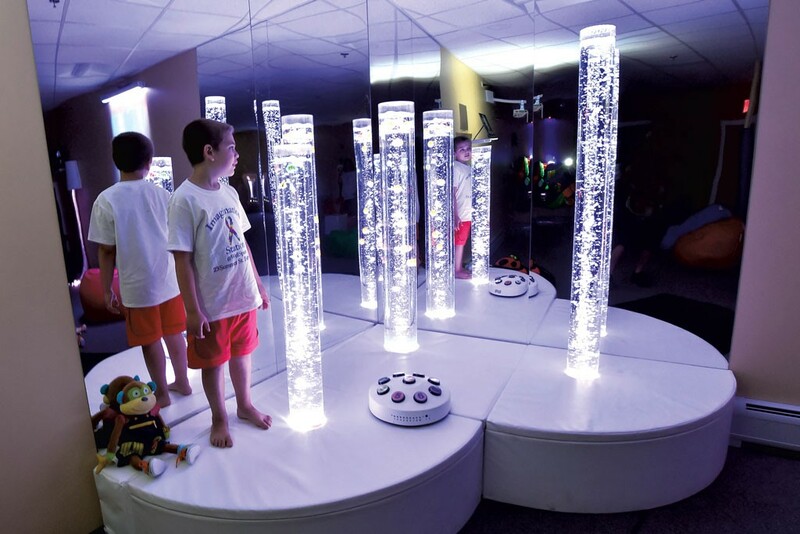 The Imagination Station is a sensory room — a high-tech, psychedelic playground where every object stimulates or soothes at least one of the five senses. In the dimly lit room, three-and-a-half-foot glass tubes filled with multicolored bubbles emit a soft, gurgling sound and glow like giant lava lamps. Interactive displays — from high-tech computer terminals programmed with educational games, to low-tech touching stations that enable visitors to feel various textures — line the walls. In the center of the room is a multicolored tower of climbable blocks connected to a projector. Touching the blocks changes the colors of the images on the far wall, which creates visual stimulation and teaches cause and effect. Visitors who need a break from these sounds, sights and sensations can retreat to a tiny alcove off the main room. There, they can sit in a beanbag chair wired with vibrating speakers, cover themselves with a weighted blanket and stare up at glow-in-the-dark celestial projections on the ceiling. At 1,200 square feet, the Imagination Station is the largest and best-equipped sensory room in Vermont. It's funded by a partnership between the nonprofit Autism Puzzle Foundation and Washington County Mental Health Services, and is located in the agency's WellSpace center. The primary beneficiaries: children with autism. "This room can get kids to a certain level of relaxation to open up windows that maybe they're too anxious [to] in other settings," says Heather Slayton, a Washington County Mental Health employee and the adoptive mother of a child with autism. 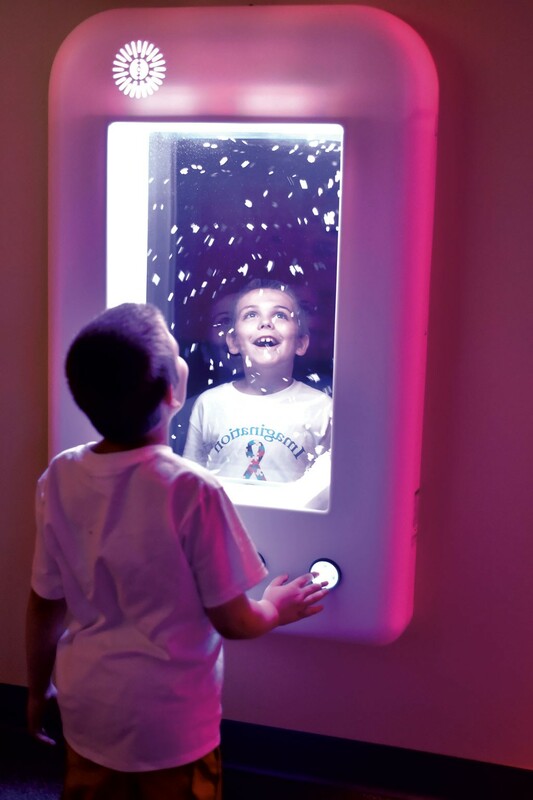 The Imagination Station is a specific kind of sensory room known as a Snoezelen Room. Coined in the '70s by two Dutch therapists, the Dutch hybrid word — pronounced "snooze-a-lin" — directly translates as "sniffing and dozing" but in practice means something more like exploring and relaxing. 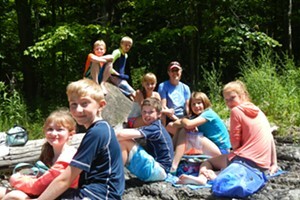 The Imagination Station is the sole Snoezelen Room in Vermont, and one of a handful in New England. 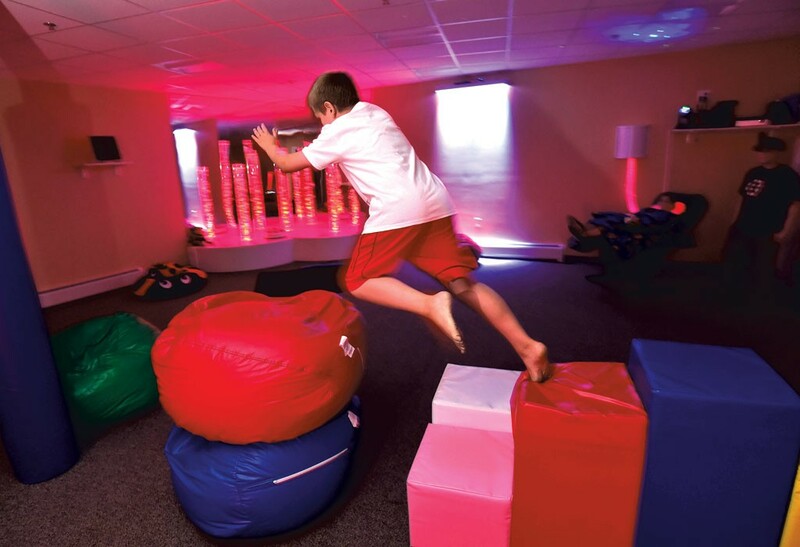 Snoezelen Rooms are designed for people with a range of disabilities and sensory integration problems. These highly interactive environments contain elements that are both soothing and stimulating at the same time and can be modified to meet particular sensory needs. Most neurotypical individuals have relatively similar sensory experiences — a bubble bath is relaxing, a birthday party is exciting, hugs are comforting. But people with autism interpret that sensory data differently. Carolyn Jackson, a Snoezelen consultant and salesperson who helped design the Imagination Station, explains that some people with autism experience everything very intensely, so that even minor stimulation can overload the brain and the central nervous system. A slight smell of soap, for example, might make this type of individual feel as if someone were "dumping it down their nose," she says. Others have the opposite experience — they need intense stimulation for their brain to register any sensory input at all. Snoezelen Rooms are designed with both in mind. The bubble tubes, the weighted blankets and the dim lights are calming, while the computer displays and other interactive elements provide opportunities for stimulation and enrichment. Linda Messbauer is an occupational therapist in New York City who brought the first Snoezelen Room to the United States in the early '90s. People with autism, she explains, spend most of their days navigating an unwelcome onslaught of sensory information. In reaction to that barrage, they sometimes "stim," or get stuck in behavioral ruts — repetitive behaviors designed to help them cope with the world. By creating a safe and relaxing environment, Snoezelen Rooms provide an opportunity for these kids to create new behavioral patterns. "What happens is, the child now has access to all of the things that they've been learning all along and it just needs to be drawn out, but you need to find a way to bring it out," she says. "Snoezelen is that medium." The most important part of the Snoezelen experience, these and other experts say, is not the equipment, but the control children have over it. Most treatment for kids on the autism spectrum involves helping them adjust to society's rules and expectations. But in a Snoezelen Room, kids get to create an environment tailored specifically to them. When Slayton goes to the Imagination Station with her son, Ethan, she only turns on the features that he requests. During a visit in July, she leaves the lights dim and turns on the bubble towers because they soothe and calm her son so effectively. This particular visit is a supervised playdate with Ethan's biological sister, who is also on the autism spectrum and lives with a nearby foster family. In the past, these two siblings have had a hard time interacting, which is one reason they live in separate homes. But Slayton wants to adopt Ethan's sister, and she thinks the space may be a helpful tool in eventually reuniting them. The Snoezelen Room helps them "relax to a point where they're able to play with each other," Slayton observes. Slayton, along with a Department for Children and Families worker and Ethan's sister's foster mom, watches while the two kids charge around the room squealing with delight, climbing the block towers and periodically checking back in at the bubble station to calm down. Slayton is so enthusiastic about the opportunities the room provides that she's volunteering nearly every day after work, training parents and providers so that more people can use the space. The Imagination Station was the brainchild of Randy Lamberti, cofounder of the Autism Puzzle Foundation. Lamberti, a financial adviser, was inspired to help families affected by autism after watching Maleia Darling's parents — his sister and brother-in-law, Keri and Todd Darling — struggle to raise her. For more than 10 years, Lamberti's organization provided mini grants to families so they could purchase materials, like weighted blankets, to help ease day-to-day challenges. Last year, Lamberti and the foundation's board decided that they wanted to close up shop and leave their community with a lasting gift. So the Puzzle Foundation donated upwards of $75,000 for Snoezelen Room equipment; WCMHS used its own funds and in-house staff to transform a former storage area into the Imagination Station, which is dedicated to the memory of Lamberti's late mother, Kay. WCMHS staff oversee the room during the day, but director Phil Wells has pulled together a cadre of mostly parent volunteers who are willing to supervise weekend and evening hours so that families can enjoy the space together. He says he's committed to turning the room into a genuine community resource, not just a facility for clients of his agency. Because the room fills a vital need for families, he expects visitors from all over northern New England. Says Todd Darling, Lamberti's brother-in-law and Maleia's father: "This is a place where you can come with your child and no one's going to judge you. If your child has a meltdown, if your child bangs his head on the wall, you're not going to get any looks." Phil Wells says he's already heard occupational therapists and parents talking about how they're going to use Snoezelen materials and activities with kids. Darling, for example, wants to use one of the digital wall panels, which measures volume, to help Maleia learn how to modulate her voice. Messbauer, the occupational therapist and national sensory room expert, believes that Snoezelen Rooms can be therapeutic, and she has many anecdotes about children's lives changing for the better because of them. But it's hard to quantify this data because each experience is so individualized, and because the goals are often pleasure-based. She's currently working with researchers from the University of Tennessee to scientifically document the ways in which multisensory environments alter behavioral patterns. In other words, to prove that these environments are more than just fun. Until then, she says, families will have to rely on foundation and community support to fund spaces like the Imagination Station. "The government's never gonna pay for this," Messbauer says with a chuckle. "Because the government doesn't pay for fun." Though Messbaeur is still trying to quantify the long-term measurable therapeutic effects, Slayton and the Darlings have already noticed dramatic short-term benefits. "He is definitely more chill when he leaves here, and it lasts for a long time," Slayton says of her son, Ethan. "He doesn't go home and stim nearly as often; he doesn't line everything up; he doesn't have to get all of his 500 Lego mini-figures out and put his armies on the table." Todd and Keri Darling are acutely aware that Maleia's every waking minute is spent navigating a neurotypical world — and that even a tiny break from that world is immeasurably valuable. Maleia "does what we tell her to do; she goes where we tell her to go; she wears what we buy her," Todd says. "So she has ... nothing in this life that is pure pleasure for her, for her to just enjoy ... We take that for granted, we all take that for granted." Learn more about the Imagination Station at wcmhs.org.